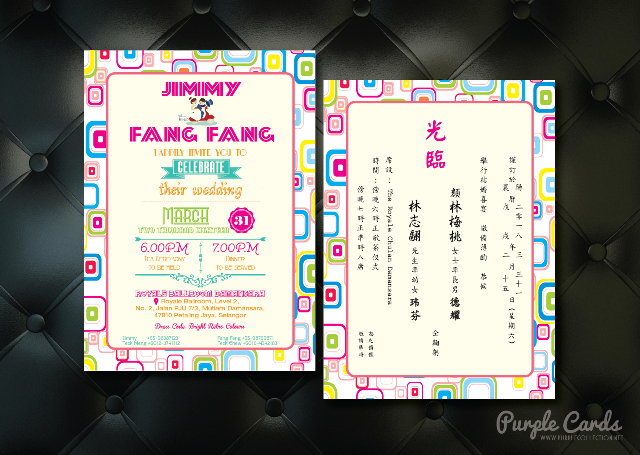 This retro wedding invitation card is designed for the newlywed, Jimmy and Fang Fang. Both of them are working in Singapore. We communicated via WhatsApp to further discuss with the preferences in theme and colours used for their wedding invites. The newlywed met each other at one of the zumba classes and so they prefer to have a wedding card that reflects their first date. The lovely couple also engaged with our company's photo booth instant print and decoration services. Is your big day coming soon? Get in touch with us now to custom design your wedding card. We do matching save the date cards, RSVP cards, placement cards, envelopes, logo, menu, welcome board, etc.